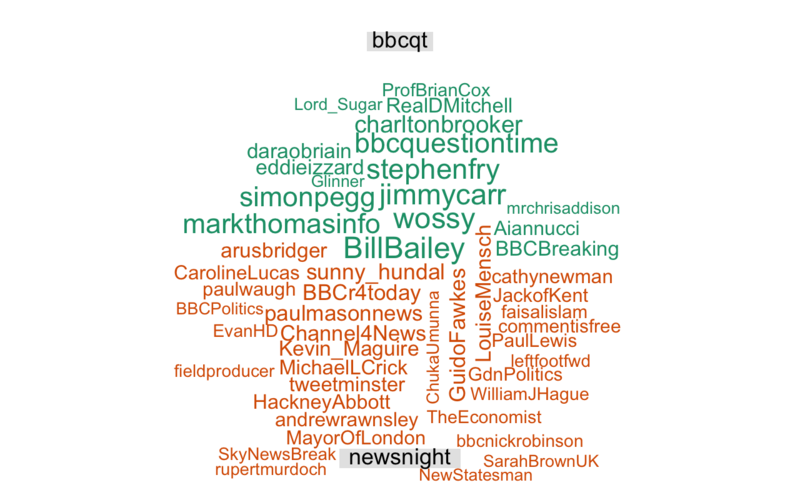 I grabbed independent samples of 1500 recent users of the #newsnight and #bbcqt hashtags within a minute or two of each other about half an hour ago. 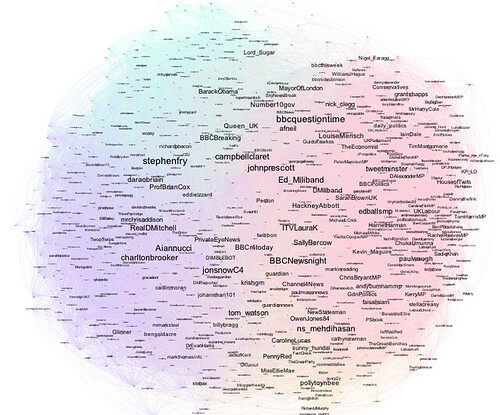 Here’s who’s followed by 25 or more of the recent hashtaggers in each case. Can you distinguish the programmes each audience interest projection map relates to? 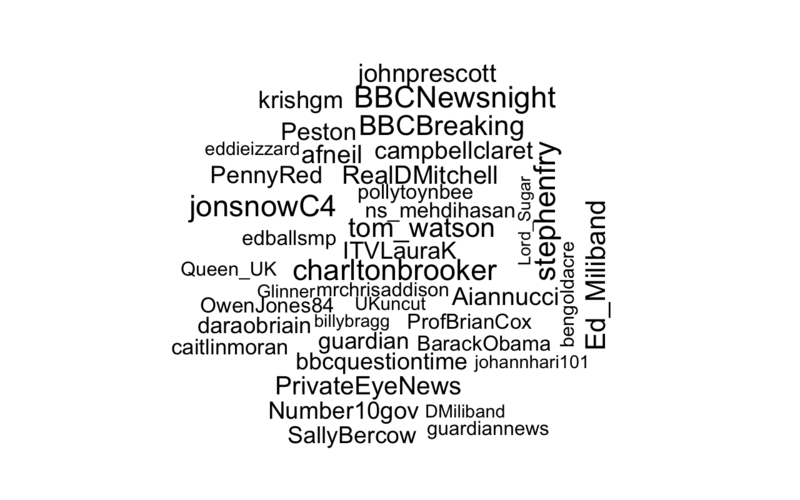 Here’s the first one – are these folk followed by 25 or more of the folk who recently used the #bbcqt or the #newsnight hashtag? 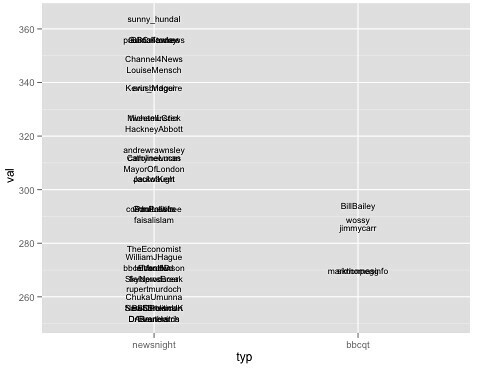 Here’s the second one – are these folk followed by 25 or more of the folk who recently used the #bbcqt or the #newsnight hashtag? – for each hashtag, grab 1500 recent tweets. Grab the list of folk the hashtagging users follow and retain a list (the ‘interest list’) of folk followed by at least 25 of the hashtaggers. Filter the hashtagger list so that it only contains hashtaggers who follow at least 25 people (this cuts out brand new users and newly created spam accounts). 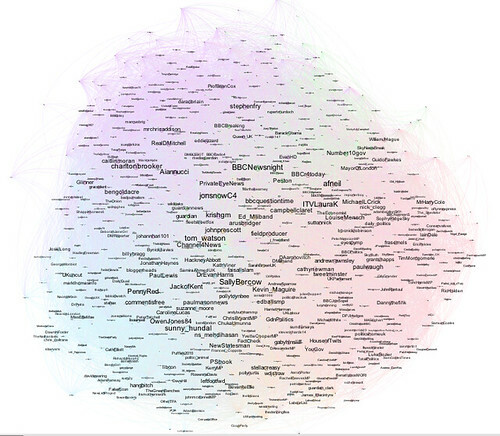 Count the number of filtered hashtaggers that follow each person in the interest list, and normalise by dividing through by the total number of filtered hashtaggers. To recap, for each tag, we now have a list of folk who were popularly followed by users of that tag, along with a number for each one between 0 and 1 describing proportionally how much of the hashtagging sample follow them. #Multiply this nromalised follower proportion by 1000 and round down to get an integer between 0 and 1000 representing a score relative to the proportion of filtered hashtagger who follow each person in the interest list. Thanks to Josh O’Brien on Stack Overflow, I can recast this data frame into a term.matrix that plays nicely with the latest version of the R wordcloud package. But how did you get the 1,500 tweets? I can never get more than 100 using searchTwitter in twitteR. But soup seems to give the output of the 10th page, rather than pages 1-10. (I freely admit I have no idea what a ‘page’ is in this context!). Should I be using something other than urllib2.urlopen()? I’d be grateful for any advice – code even better. though it doesn’t seem to include a page parameter and so far I’ve still only managed to get it to produce 200 tweets, even though i set max-results=1500. Ah – yes, my mistake – I was talking about Twitter search API not the R library (I’m not that familar with twitteR – will have to explore it again…). Many APIs used page results, as do many search engines. If you run a search on Google, the first page of results is, err, the first page, the second page of results is, err, the second page, and so on. If you ask for page 15, you get the results for page 15, not the results for pages 1-15. (This makes sense, right? If you have 20 results per page, you don’t want the 500th page of results to have to return 10000 results and then require the client to have to work out what the last 20 results are.) If you want to get 1000 results at 100 results per page, you need to grab the first 10 results pages with 100 results on each. 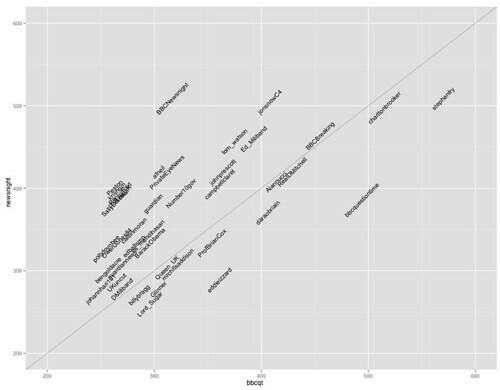 Next Next post: Experimenting With iGraph – and a Hint Towards Ways of Measuring Engagement?